I was bullied twice. The first time was in Grade 1 by Ronnie. He’d take my pencils and other school stuff, hide it so I won’t be able to find when class starts. It went on for months. I just let him do his usual bullying. Until one day, I got his notebook and ripped it right on his face! The bullying stopped. The second bullying happened when I was in first year high school. Charlie kept on disturbing and making fun of me while I silently study when the teachers are out. It went on for months. I just let him do his usual bullying. Until one day, I took his basket project to be submitted that day for Home Economics, I smacked it on his head! The bullying stopped. To all my readers, I’m not writing this because I encourage violence. Even my son was bullied once but I didn’t tell him to hurt those boys. What I always tell my children, "DO NOT BE AFRAID. STAND UP IF YOU’RE RIGHT, IF THE SITUATION CALLS FOR IT, FIGHT IN THE PROPER VENUE! I live a fairly quiet life. I don’t blog for a living. I blog because I like sharing my thoughts with the hope of sending some inspiration to readers who might need it. A couple of weeks ago, a certain Tony Ahn FB messaged me,“Hi Joy! Are you interested in dating?”. I did not reply plainly because I am married. I also know about foreign men scamming Pinays. After a day or two, Tony Ahn messaged me again, “Hi! I sent you a friend request.” I checked his profile and saw that this Tony Ahn is friends among many of my co-bloggers so I accepted his friend request. Me: I met Arpee once but we didn’t discuss about this. What is Two Sides of Dating? Tony Ahn: It’s a blog I used to write with Earth Rullan. Tony Ahn left the conversation and unfriend me in FB. Arpee left the conversation and blocked me in FB. I let this matter pass knowing that these people will do the right thing but Mr. Arpee Lazaro kept the post in his timeline with my name while he blocked me. What he did stirred speculations, putting my name on a bad light. Friends and co-bloggers started messaging me. 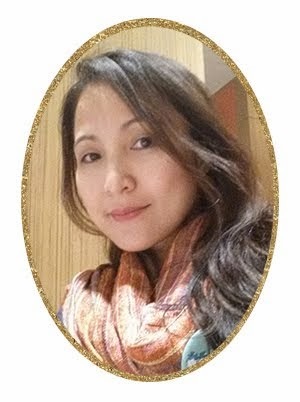 I wasn't able to sleep the whole day but I let it pass again as I want peace and quiet for I am a woman, a mother of three and a wife who chooses to dwell on the happy side of life. You may be richer than I am but I'm not a coward. "I apologize when I'm wrong. I fight when I'm right!" Lumabas ang magigiting na lalaki, LABAN KUNG LABAN!!! I will not allow anyone to ruin my quiet and joyful life, especially by people who have no respect for women. Women must be treated with respect. Men who mistreat women are not men. And I say to all those being bullied, stand up against bullies!!! Hindi ako mayaman, Willa, MAGANDA LANG! hehehehe. When your right fight with your rights. Never stay silent. Corrine, thanks for the support. WOMEN POWER!!! What I noticed about you is that, you look prettier and sexier now, especially in distressed pants. :) Seriously, bullying should stop! Period. Yeah, Nuts, on the brighter side of this unhappy situation, I lose weight even if I eat a lot. Thanks to your pants. And yes, NO TO BULLYING! I actually googled for a quote for bullying to include in my comment here and your name was on page 1 of Google. Wow! Quotable quote na eto. I-screen cap ko ba yung na search ko sa google? Ikaw na talaga! Haba ng hair! buti di mo ko binubully, den. hehehe. puro boys nga nambubully sakin no. kung crush dapat love letters binibigay hindi, pang-iinis, hehehehe. Sabagay! haha well immature and irrational naman talaga ang mga bullies. yes, beth, you are more feminine. baka these boys think i'm a boy din...hehehe. liars dwell in the dark! brave, honest and pretty like you needs to do more "selfies". Blessed are those who fight for self-respect in honor or their family. and not allowing yourself to be intimidated. No one can put a good man down. Nobody can put you down. . Kaya mo yan Ate Joy! ^___^ Good vibes! Thanks, Mama Josie! Kakainis e, iniistorbo ang katahimikan ng buhay ko then sasabihing amalayer, hehehehe. yeah, Francis, mabuhay ang mga na-bully! Hindi lang ito bullying. This is borderline exploitation. Medyo shady yang Arpee character ah. And that other guy, hugas kamay agad. 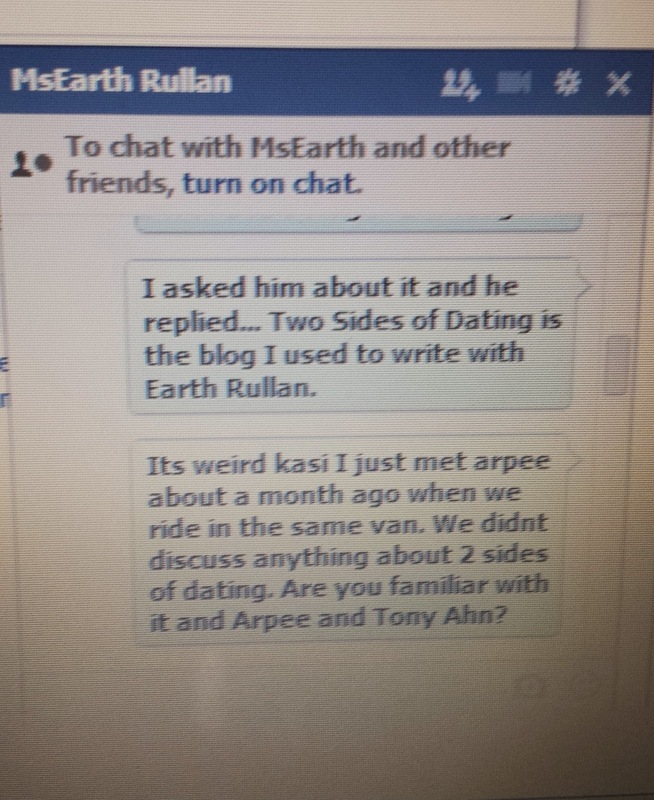 From the context of Arpee's message na saying kasi he's an eligible bachelor, ang obvious masyado kung ano ang pakay. Best to disassociate with these two sleazeballs. Who knows how your association with them is exploited for other purposes. These men do not respect women. Nagkamali silang ng inoferan! Go fight for your right, Ms. Joy! pag di pa sila tumigil pwede mo itong kasuhan. Thank you for the infos you sent. Please check your "other" facebook folder, my msg won't go direct to your inbox as we are not connected in FB. Thanks. I think by "bad intel" he meant himself telling Tony that you were interested to be considered. It has nothing to do with Earth. You might have misunderstood him on that note. But I do agree that his post in general seems to have an ulterior motive disguised by his apparent intent to protect your privacy. The post was insincere and there's this underlying tone of mockery most especially when he quoted your words. You are correct, he mocked me. He thought he can bully me like what he did to many. I get private messages from people he bullied in the past. It was good to distance yourself from these people. They're so baduy to be honest. 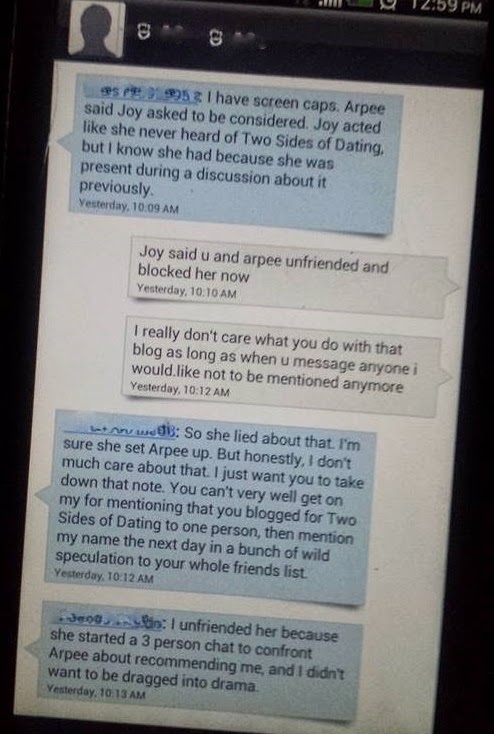 Hi Joy, I had been following this incident and not knowing anyone involved in it, I have to ask you . . . Are you sure you are talking with Real Men? I am a man, real at that but i don7t communicate with women the way they did. With all the due respect, I think there is nothing sexist about this - this is a case of person trying to take advantage of another person. The gender of the person in question is irrelevant here. This sounds like a rough deal a. Tsk tsk. Funny how grown ups in their 40s can resort to these antics just to get their way. While I am sorry that you had to go through this, I think the fact that you're fighting back and laying it all out has some effect in correcting this (mis)behavior on others. That Facebook post was just so utterly passive aggressive. It's laughably insincere. All the best to you, ma'am. Hi Joy..I just want to tell you that I support you all the way. I just feel sad that some will say na di naman bullying yan or di naman malala yan kasi walang name calling or di ka naman mocked online. Gaano kalala pa ba dapat ang gawin before says something or does something. I think Arpee is wrong on this one (yes,Arpee,just in case you read it, bec I don't comment anonymously). 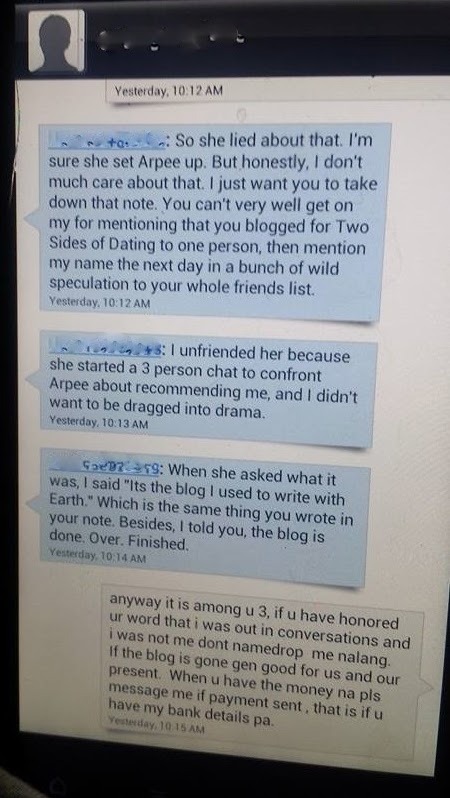 If he did not gave your profile to Tony in a first place,without informing you first or asking for your permission, hindi sana nagkaron ng miscommunication.I mean, di bah?Syempre,as a married person offending talaga if someone asked you if you are interested to them,tapos hindi pa clear if he is asking you if you are interested to write for the blog or interested to him as you know. Tapos ikaw pa ang gustong baliktarin as if you "offer" yourself or service to them,like heller!?!?!?! Thanks Willa, for the support! nakilala ko sya at violente sya magsalita, lalo na sa babae. pag nakuha na ang gusto iwan, pag may nasabi ka na di nya gusto, bully, away..naghahanap ng gulo at lagi sya tama... bilog ang mundo. alamin kung totoo ang pangalan ng lalake na yan.tama na. Dear anonymous, I understand you. This is not just my fight but for all those who have been offended but chose to keep quiet. Dear ANONYMOUS, I will only publish your comments if you will be brave enough to comment publicly. Obviously, you're not as brave as me. Oh, you feel sorry for these men. Kung babae, sana hindi mangyari sayo ito. Kung lalaki, magpakalalaki, comment here publicly, do not use alias. Are you afraid of me? I live in peace, brothers and sisters! Thank you so much ANONYMOUS for visiting my blog. You seem to have some problem in bullying too. You have to be brave. I might be able to help you. Let's meet in person. Oh my, Sorry you had to go through this sis. If there's anyone so "chillax" na nakilala ko, it's you. 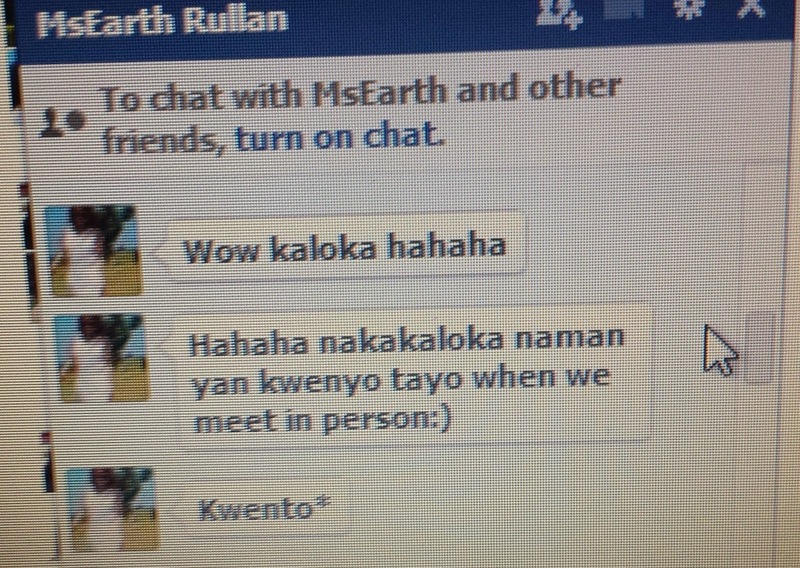 I just wish the person asked you first before ipasa sa iba ang profile mo. Stand firm sis - it's about time bullying is stopped - any form of it! Thanks Nhessie. I'm not sorry that I had to be the one it this situation. I believe that I was put in this because the universe knows these men cannot harm me like they did with others. Though this happened 3 years ago, I'm sharing because I'm receiving messages again from the U.S, Korea and China about these men. Two of these messages were from girls who had a connection to the other guy. He never stops fooling Filipina women. I hope that women will be careful dealing with these two. Oh man. I'm sorry you had to go through this, Joy! It would all have been settled if everyone just spoke to each other in private in the first place. :( I do understand why you wrote this, though, because you have to speak up too. I suggest that you have a lawyer ready in case this goes out of hand. That "Tony Ahn" even had the balls to sue me for libel. I have 2 lawyers who handled this case. The libel petition did not materialized because the fiscal ruled out that I was merely protecting myself and dignity as a married woma, and mother. Minsan nakakalungkot yung mga ganitpng stories sa blogging word. Buti nalang you stood against them. Sana this wont happen to anyone anymore. Though this happened 3 years ago, I'm sharing because I'm receiving messages again from the U.S, Korea and China about these men. Two of these messages were from girls who had a connection to the other guy. He never stops fooling Filipina women. I hope that women will be careful dealing with these two. So sorry to hear this happened to you. Good thing you were vigilant pa nga eh compared to the other women who got scammed. This is exactly why I don't accept FB friend requests from people I don't personally know, unless I know someone who can really vouch for them. Thanks for sharing your story. At least others can now be warned. When I was in Kindergarten I got bullied by a boy classmate. I didn't actually stand on my own, I got my Mom, took her to this classmate of mine and pointed on his face. "Mom, he keeps on bullying me." From then on he stopped. As I see it now, sometimes you don't have to fight alone for there are others who are willing to help. I agree that we have to fight when you are right. Keep your chill Sis. As much as we want to live peacefully and out of the limelight there are just some people who would really test your ability to do so. You're right sis, don't let anyone bully you especially if you've done nothing wrong. Woah! Based on your screencaps, you were really the wronged one here! For starters, Mr Lazaro should've informed you before doing anything and not just assume that he was the one doing you a favour. Same thing for Mr Ahn. And he could've used a less tacky opening line lol. I couldn't blame you for reacting the way you did! Hope this is all okay now! Wow. It's been two years na pala since this happened! Grabe. I had my fair share of crazy blog issues but kakaiba ito. Ang hassle. I think things went wrong when Earth posted about it publicly. Kaya ayun, nag-react yung Tony Ahn and of course, si Arpee. Buti na lang, okay na. Nakaka-offend nga yung offer nila. But if this happened to me, I'm sure my husband will be reaaaaaaally mad! Buti na nga lang my hubby is logical. This is what I don't like in the blogging world. These kinds of interactions. Especially people who say things about you or create controversies while you're unaware. Has happened to me as well and probably to most bloggers. You did the right thing Joy.